Getting kids to eat a healthy breakfast can be a next to impossible task. Depending on their ages and morning moods, we might be lucky to get a glass of instant breakfast drink into our kids before they're out the door. No matter what their ages, it can a real chore to lure kids to the breakfast table! Kids going to school need breakfast but often balk at the thought of eating in their morning rush out the door. Kids really want to do their best! Let your kids know why breakfast is important, and how it WILL make a difference in how they do in school. Ask them to take part in the grocery shopping or help with the shopping list. Like adults, kids have different tastes, and they know what they like. Some kids like cold cereal, some like hot, while others turn up their nose at any cereal and choose a donut or muffin. Pre-made breakfast bars are another alternative, but be sure to check the labels for nutritional value and consider making your own. A breakfast casserole takes a little time to prepare but it can be done the evening before then refrigerated. Pop it in the oven in the morning for 45 minutes while everyone is getting ready and you have a quick and nutritious breakfast! Set the breakfast table the night before, even if it's only for juice and cereal. French toast is another quick and easy breakfast, and a sure kid-pleaser. Add a little cinnamon to the egg batter for variety. Cut into shapes for younger children. Keep pancake or waffle batter in the refrigerator, ready to pour on the griddle. If you like to bake, you might keep a supply of muffins in the freezer, ready to warm in the microwave. Try making your own nutritious granola and granola bars. Quesadillas or breakfast burritos just might appeal to the "grab-it-and-run" types. Pizza for breakfast? English muffin pizzas sprinkled with cheese and microwaved are a hit with most kids. Almost anything can be sandwiched in a biscuit; scrambled eggs, sausage patty, a small chicken patty, or a slice of ham with cheese melted on top are just a few ideas. 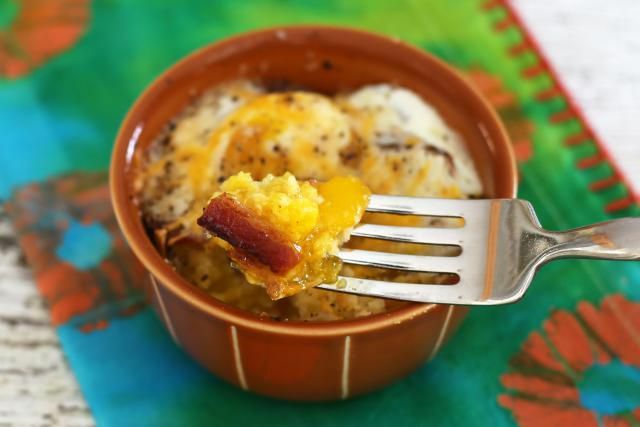 Use leftover cornbread or cornbread muffins as the base for this nutritious egg and bacon bake. Feel free to use cooked sausage or diced ham in these single serving casseroles. These delicious pancakes are filled with mini chocolate chips. They're fantastic with maple syrup. For an extra special treat, top them with chocolate sauce and whipped cream. Serve these easy muffin cup sausage frittatas with ketchup, salsa, or marinara sauce. 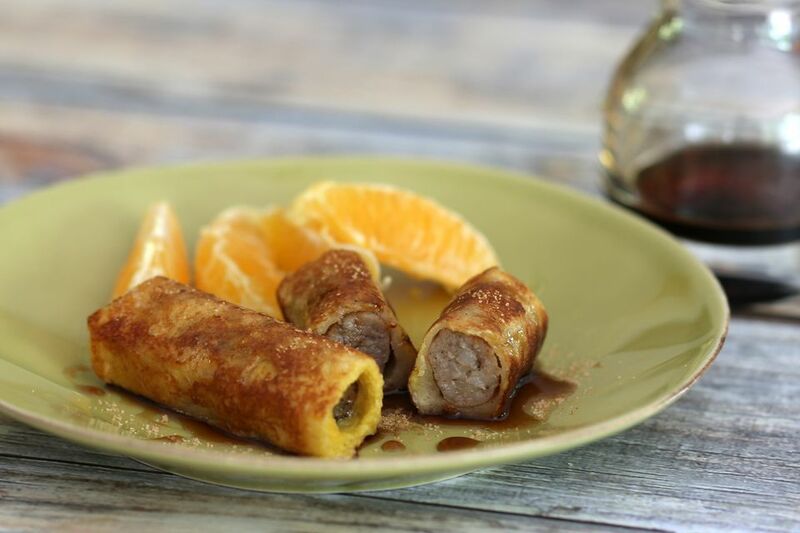 Serving cinnamon French toast sticks​ is a great way to get reluctant kids to eat their breakfast. Jazz them up with some extra cinnamon-sugar if you'd like. These carrot muffins are filled with nutritious shredded carrot and chopped walnuts. Split biscuits are the base in this hearty breakfast casserole with sausage, eggs, and biscuits. This is a great way to start a busy day and it makes a fabulous holiday breakfast. This hearty crock pot breakfast casserole cooks while you sleep! What could be easier? Muffins are a great choice for busy mornings. Make these delicious apple muffins ahead of time and keep a few in the freezer for rushed mornings. This extra-special pumpkin French toast is perfect for fall breakfasts. The spiced egg batter is delicious, and the syrup is very easy to make. These pinwheels rolls are made with puff pastry and ground breakfast sausage. Serve them along with scrambled eggs. These basic blueberry pancakes are always a hit with kids and families. If fresh blueberries are in season, make a blueberry sauce to serve with the pancakes. These easy chocolate chip muffins are easy and delicious. We used mini semisweet chocolate chips in the muffins, but regular semisweet or milk chocolate chips would be great as well. Or add toffee chips or nuts to the muffins. Add an egg or two and sausages or bacon and you have a hearty skillet home fries breakfast everyone will enjoy. These biscuit-like chocolate and pecan scones are wonderful with a glass of milk, and the kids will love them. This streusel cake is moist and delicious. The generous cinnamon spiced brown sugar crumb topping is simply irresistible. This fabulous breakfast bake with grits, sausage, and eggs is made with cooked quick grits, browned sausage, and whole eggs. These corn waffles are like corn fritters baked in a waffle iron. They are amazing with maple syrup! The eggs make a simple shirred breakfast with two eggs per person. Add bacon, ham, or sausage, if you like, or serve them with fresh sliced tomatoes or fruit. They're great with baked beans as well. These heavenly little deep-fried spiced apple fritters are such a treat! Dust them with sugar or enjoy them with syrup. This impromptu ham and cheddar breakfast casserole, or strata, is made with whatever bread you have on hand, along with eggs, ham, and cheddar cheese. The dish takes about 10 minutes to prepare and then it bakes to perfection in about 45 minutes. These moist pumpkin date muffins get extra texture and fiber from the oats, and the simple streusel topping makes them special. Serve these basic pancakes with maple syrup, fruit syrup, or berries for a delicious everyday breakfast. Split these Southern buttermilk biscuits and fill them with country ham or top them with creamy sausage gravy. This basic French toast is simple and delicious. Make a big batch and freeze it in individual freezer bags for breakfasts all week long.